Gooseberries give a subtle edge to this refreshing soup. It’s great hot but even better, I think, chilled. Either way, a little smoked fish really finishes it off beautifully. Melt the butter in a large saucepan over a medium heat. Add the onion, cover and let it sweat, stirring occasionally, for 10–15 minutes until softened and translucent. Meanwhile, peel the cucumbers, halve them lengthways and scoop out their seeds with a teaspoon, then cut the flesh into 2cm slices. Add the cucumber slices to the onion in the pan, along with the diced potato and gooseberries. Stir over the heat for a minute, then add the stock and some salt and pepper and bring to a simmer. Reduce the heat to low, cover and cook for about 20 minutes until the potato, cucumbers and gooseberries are tender, stirring occasionally. Transfer the soup to a blender and whiz until smooth (in batches if necessary). Return the soup to the pan and whisk in the crème fraîche. Taste and add more salt and pepper as needed. 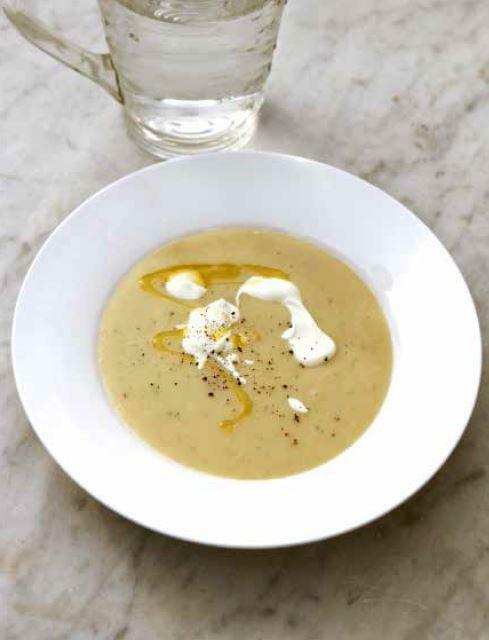 If serving hot, ladle the soup into warm bowls, dollop more crème fraîche on top and finish with a trickle of extra virgin olive oil and a grinding of pepper. Alternatively, let the soup cool and refrigerate it for a few hours before serving in chilled bowls, finished in the same way. Flake about 75g smoked trout over the hot or chilled soup to serve. This looks great and is very refreshing. Make the soup as above, omitting the gooseberries, then chill it. Stone and halve or quarter 250g sweet cherries and place in a saucepan with the juice of ½ lemon. Cook gently to a chunky compote, about 10 minutes. Leave to cool, then chill. Serve the soup in chilled bowls, with the cherry compote spooned over the top (it will partially sink and then marble the soup with lovely pink streaks). Finish with soured cream, a trickle of extra virgin oil and a grinding of black pepper.